Copygate rumbles on. Oh joy. 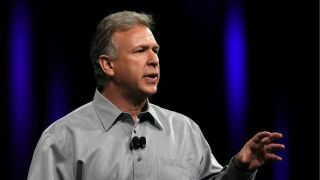 Apple's top PR bod Phil Schiller has claimed Samsung's trademark infringement diminished the global view of the company's innovative verve and made it more difficult to sell the iPhone and iPad. During the retrial (as if the world needed one) of the great Apple vs Samsung patent war in the US, Schiller said Samsung's copycat tactics caused the tech buying public to doubt Apple's design skills. Schiller, Apple's Senior Vice President of Worldwide product marketing, told Judge Lucy Koh he was "quite shocked" when Samsung unveiled the first Galaxy S. "They went and copied the iPhone," he said. "It weakens the view that the world has for Apple," Schiller added, saying it caused consumers to "question our innovation and design skills in a way that people never used to." Upon being shown the 10-inch Galaxy Tab, Schiller replied: "I don't know which Samsung devices are allowed to copy our devices and which ones aren't. It looks like an iPad." The retrial taking place in California doesn't centre on whether Samsung is guilty of patent infringement, but around the damages that Samsung should pay. In August last year, the jury ordered Samsung to pay $1.05 billion in damages, (around $650m, AU$1.12bn) although that was later rescinded to a lower amount. Apple wants $380m (around £235, AU$406m) in damages, but Samsung only reckons it should have to pay $52m (around £32m, AU$55). Regardless of the outcome we're pretty sure they'll be at least 5,627 appeals and counter-appeals from one side or t'other, so strap yourselves in guys.